Why is Meteobridge reporting the "high temperature" of the day as its own internal box temp? 103 degrees? How can I prevent this? What is mapped as the temp in your "Live Data" tab? But the High-Low_average part for a day shows the High-value from "Yesterday" or something like that?? New error at WU, maybe? Weird. Mouse over it and let us know what tag it is - th0temp etc. 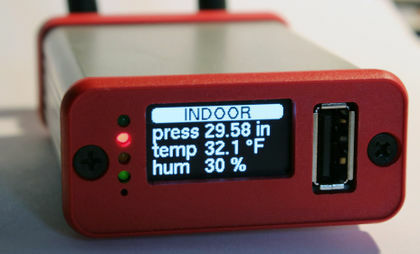 Because it is mapping to thb0temp (indoor) and not th0temp (outdoor)? What firmware version of the Meteobridge are you running? Also what kind of Meteobridge is it (regular, Pro, Nano)? I love playing with computers, however I was not trained in them and I am not an IT person like so many here appear to be. Switch to the std. temp display and post what it shows please. That is the value we started with in the first post. Since October 12 there are these strange values visible in the uploaded data. Seems there were other temp problems that day and following days. Since then, during 24 hours nearly all values which are uploaded look like normal "outside temp" values. Each day at different moments one or two spikes are reported for current outside temp and another high value for highest temp of the day. What happend at October 12? Is there maybe an USB-disk problem with the MB-Pro? When the MB PRO picks up tons of RF noise there might be a false packet here and there that has a valid CRC by accident. What is your average sensor signal strength (live data tab tells, might be in the between 60 and 70)? What is the percentage of fine packets (indoor sensor tells a percentage)? what is the RF threshold you defined on "station" tab? Having that data one can optimize your reception and by doing so make the occurrence of false reading much less probable. So I need to move the antenna? It doesn't have a whole lot of cord available, I could buy the newer one with the longer cord. My station sits on the roof, perhaps 10 feet or 15 feet above it. I don't know why the temp "spikes" are occuring. But I have to prevent this, they are unacceptable. I moved my antenna a couple of feet higher. I don't know what further to attempt? I am my own worst enemy at times. I failed to reestablish A/C power to my Meteobridge Pro box when I switched routers. So for about 3 weeks, I was not providing any data to CWOP. I didn't catch this, because my data was still being sent to WU via Virtual Weather Station software on my desk top. Are you absolutely sure that VWS is NOT uploading data to WU? Thank you for bringing this up and for reading the blog. I don't know enough about software conflicts to understand how VWS could interfere or cause false temp spikes. However, based on your suggestion, I have disabled the inputs to WU from VWS, so today I will see if the spikes disappear. Sounds like you were double reporting to WU with both VWS and the Meteobridge Pro. I don't think that is a good idea at all. Good catch wvdkuil! Another spike just a while ago while I was outside and after I had disabled reports from VWS to WU. So that wasn't the problem. Unless someone has an idea of what's wrong, I suppose I could next disable meteobridge and report ONLY from VWS and see if the spikes stop. If they do, that pretty much IDs meteobridge (or that is, my particular red box) as the source of the problem. Power down the Meteobridge Pro for like 30 minutes. That way you can make sure that nothing else is uploading to WU with your ID and password. Also if your Meteobridge Pro is from Ambient and it includes a license for ambientweather.net make sure that if you are uploading to ambientweather.net that you don't have it configured there to also upload to WU. You would check that through your ambientweather.net account. 2 more "spikes" of high temp in the predawn hours. Does anyone know if a red Pro box can be sent for evaluation and repair? It's not of much use to me if it is going to report false readings. My station is not reporting these spikes. I can look on my VWS logs and see no unusual temperatures. Check 1: As asked by @galfert , completely switch of the MB-Pro for one or two hours. Then one can see if during those hours some other program/net is uploading to your WU account. The graph should be completely empty. Check 2: If the WU-graph is empty, it could be someone else Davis equipment nearby which is incidentally recorded by your MB-Pro-Red. If available you could connect the Davis console+logger to your MB-Pro and use that for a day or two instead of the built-in Pro-Red receiver. If their is again a spike in the the WU-graph the MB-Pro is faulty. Check 3: If the WU-graph is normal without spikes, with an USB connected station, you have to tweak the Pro-Red reception. Best thing to do is either answer the questions by Docbee, he is the author of the MB program: https://www.wxforum.net/index.php?topic=35328.msg361817#msg361817 . Thank you, that is very helpful of you. I will be doing these things. These problems developed after I (stupidly) left my Pro unpowered for 3 weeks during a home router swap out. Prior to that time, I possibly/likely had more than one service sending data to WU for no telling how long without any problems observed. As far as the antenna reception, the external antenna for the Pro is in exactly the spot that had functioned without error for a full year. The Pro, meanwhile is connected to the router directly with ethernet, so it sits right next to it. I unplugged my Pro yesterday just before 1pm and left it unplugged for about 40 minutes. During that period, I saw that all inputs to WU had ceased, and I was just a non reporting station. Interestingly, the unit spiked its temp right as it was being unplugged. Since it has been plugged back in, no anomalies have occured for 19 hours. I am hoping that this simple reset did the the trick, and I will be keeping a close eye on it for a few days. If problems being to recur, I will contact Mr. Docbee. Appreciate the help and suggestions that I received. I had another temp spike just an hour or so ago, so that is discouraging. As far as my reception, I suppose I could move my Pro box upstairs, so that it basically sits directly under the roof station instead of a full floor beneath it. Unfortunately, in that case, I cannot have it ethernet connected to my router, but the current situation is not acceptable. So, unless there are other alternatives, I will shut down the Pro for now (returning to VWS reporting to WU and CWOP) while I re-read the instructions on how to use the Pro wirelessly. I already use an external antenna for it, it seems like it should be able to receive signals from 15 feet above it.